Spring is right around the corner and you know what that means?! 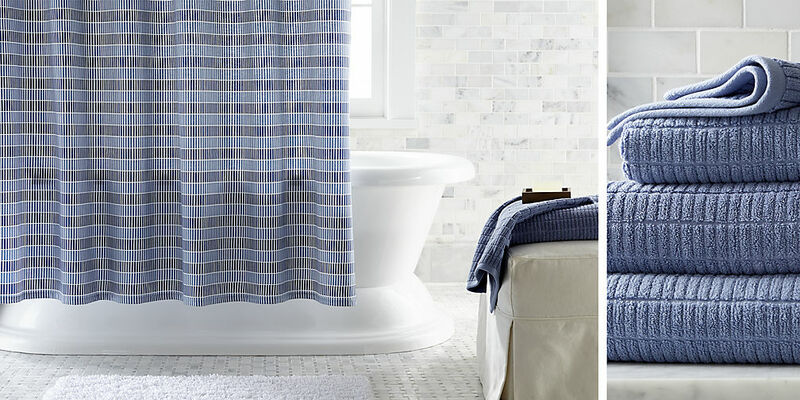 We're all getting antsy to freshen up our homes and give our spaces an updated and fresh look. With all of projects on the honey-do-list, here are a few ideas you can cross off the list yourself to freshen up a bathroom without breaking the bank for a complete remodel. 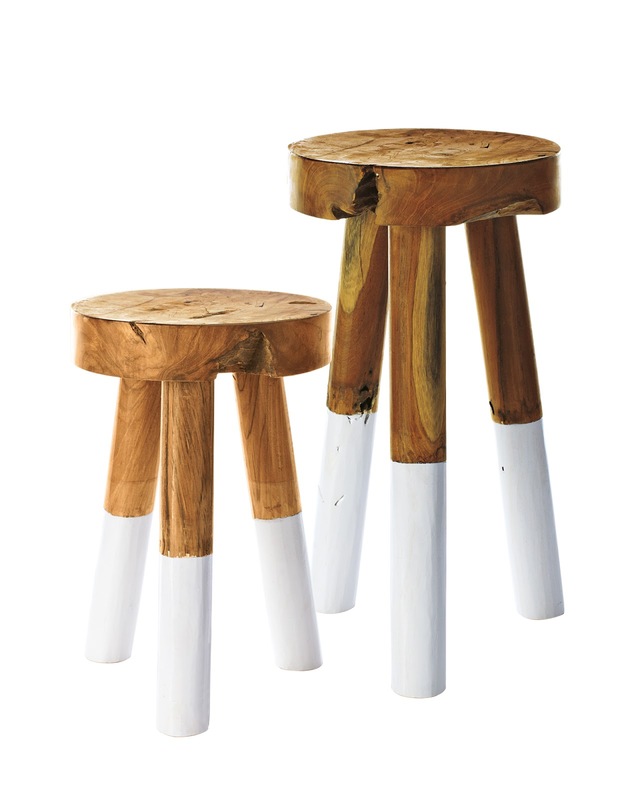 This trendy look is by Amber Interior Design. 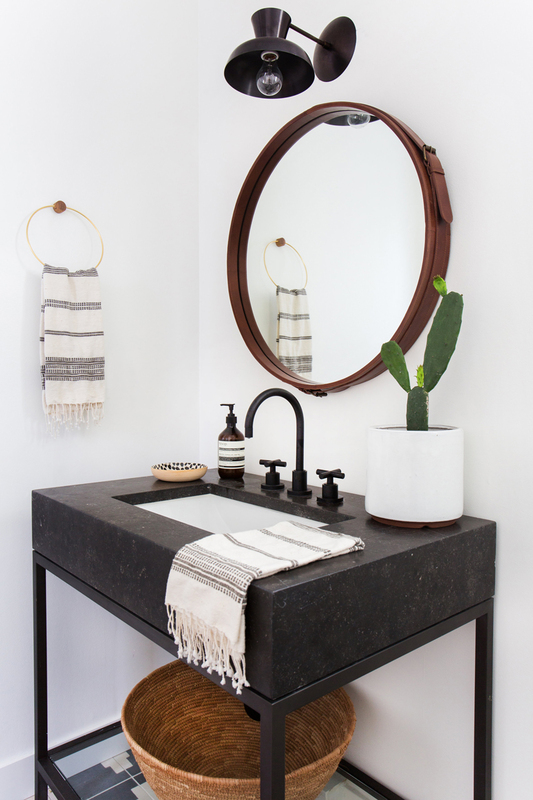 Update your bathroom easily with a few statement accessories like a new hand towel ring and hand towels. 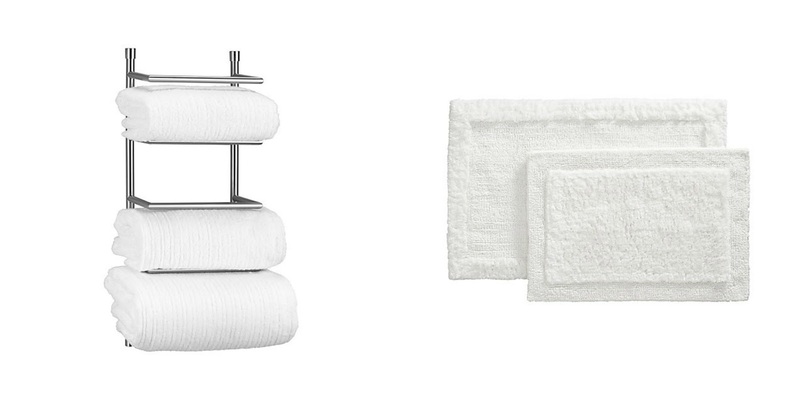 Replace your standard traditional hand towel ring for an updated fresh look and add new hand towels. 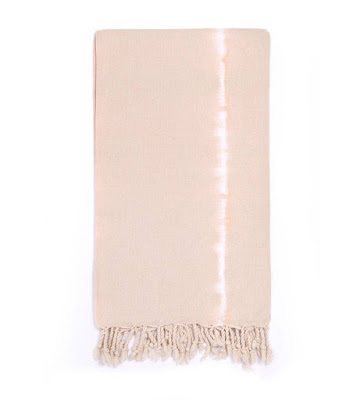 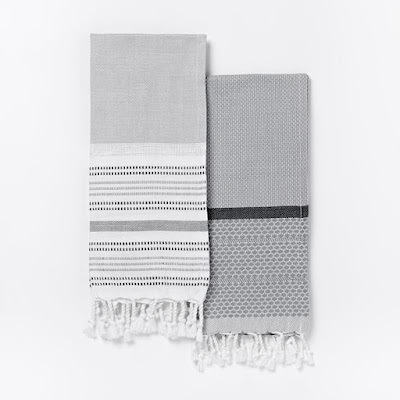 Similar hand towels from West Elm in a range of colors are currently on sale starting at $9.99. 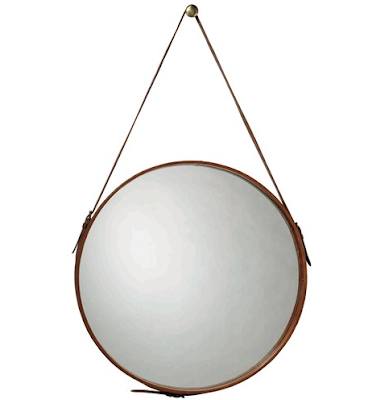 Ballard Design has a Round Leather Mirror for $499. or Wayfair.com has a great selection of round mirrors. 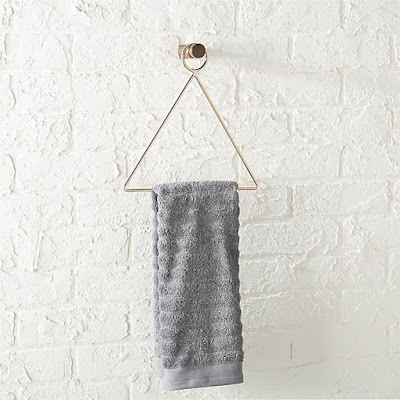 How about this funky Copper Accessory-Towel Holder from CB2 for $14.95. This Turkish Tie-Dye hand towel would look awesome paired with it! It's from Domino. 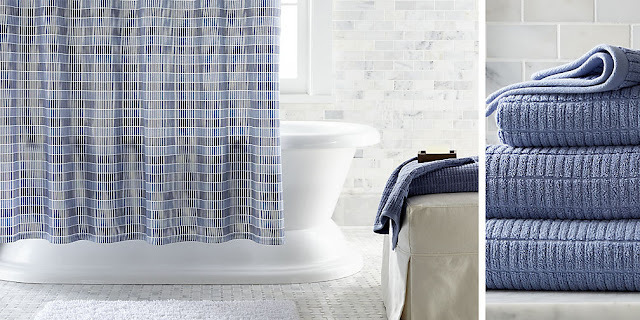 Add a whole new look to your bathroom by installing a new towel rack and towels. 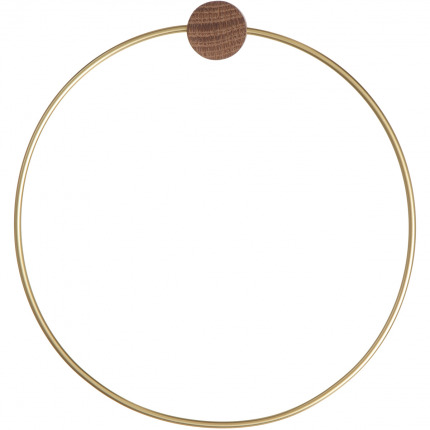 Here are some ideas I'm loving. At $69.95 this wall mounted towel rack adds a contemporary flair in brushed steel. Finish the look with soft rolled towels and new white spa bath rugs for a boutique hotel style. 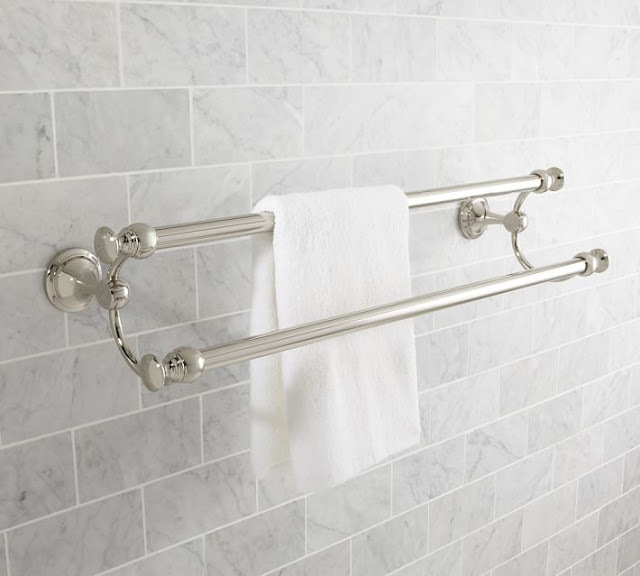 If you're looking for something more transitional, I love this double towel bar from Pottery Barn for $79. 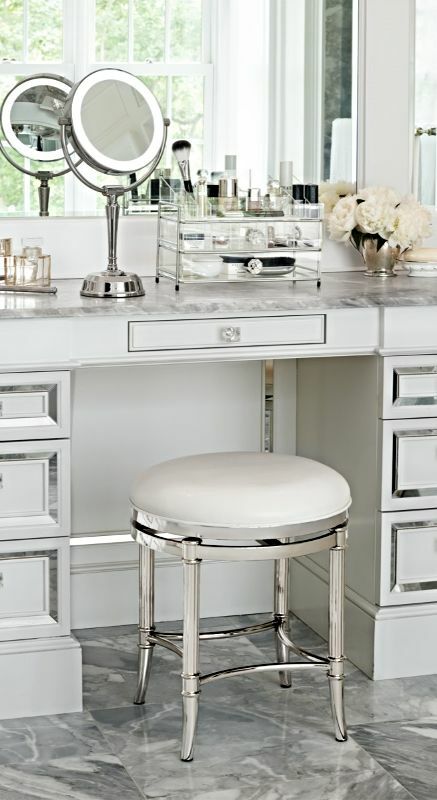 It's shown here in polished nickel finish and available in three additional finishes. 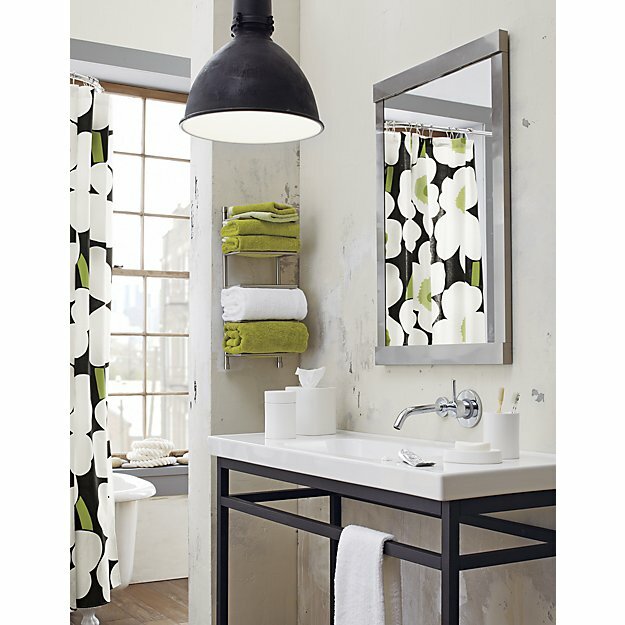 If you don't have room for a towel bar, installing towel rings or hooks make great options. 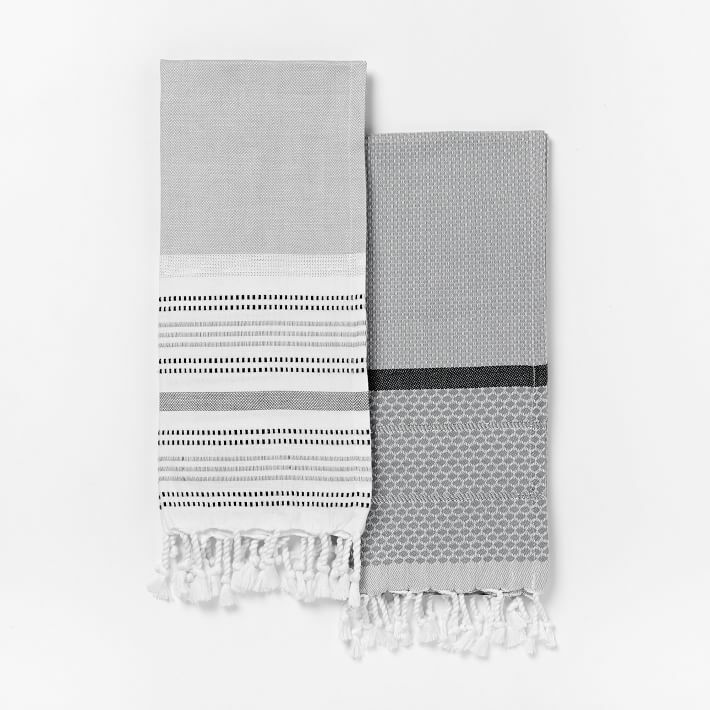 In fact, adding a hook to a door provides a great place to hang additional towels, robes, or just helps to keep clothing from littering the floor. 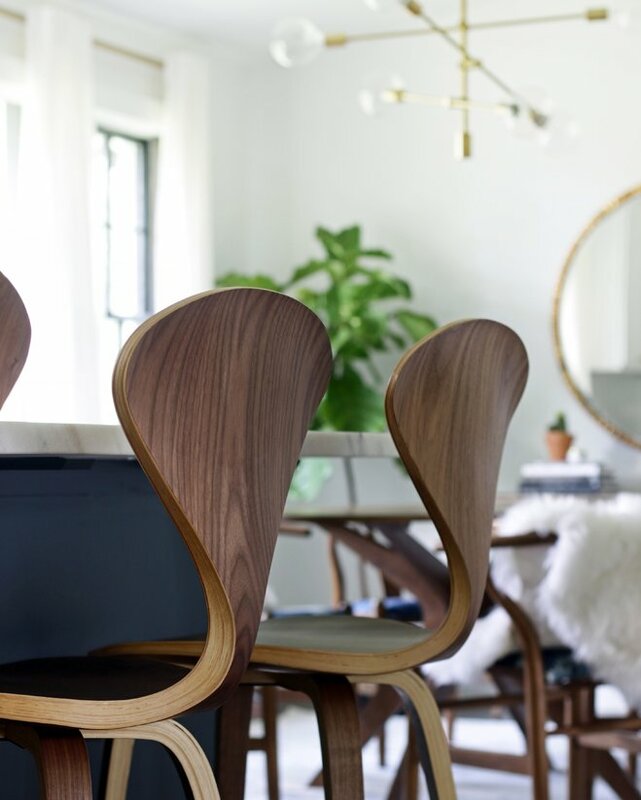 If you see it done by Amber Interior Design, you know it's hot. 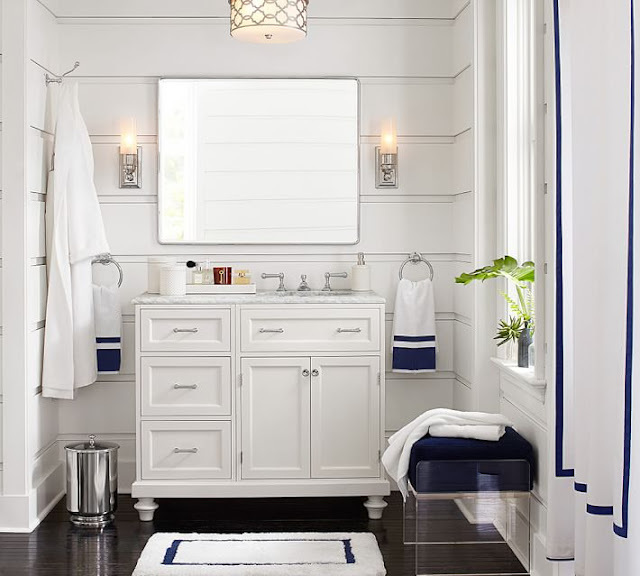 Towel ladder racks (with or without shelves) can be used as a creative option for hanging towels while adding fresh chic look to your bathroom. 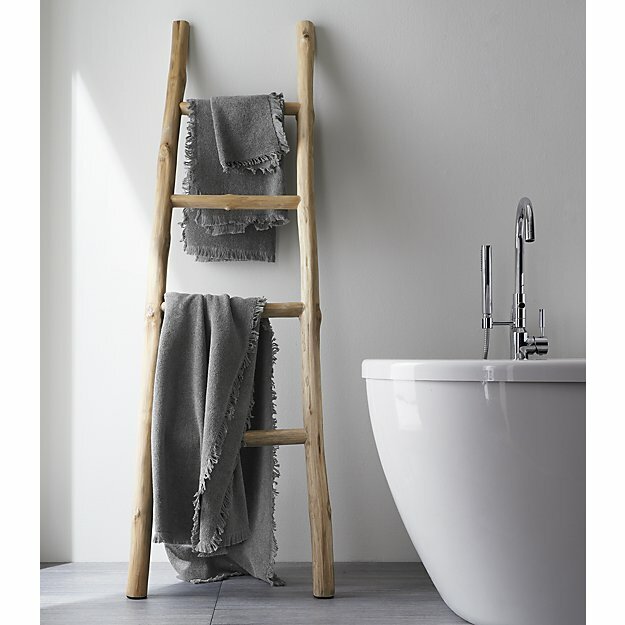 I really like this teak ladder from Crate & Barrel, but you can find these several places in a range of prices. 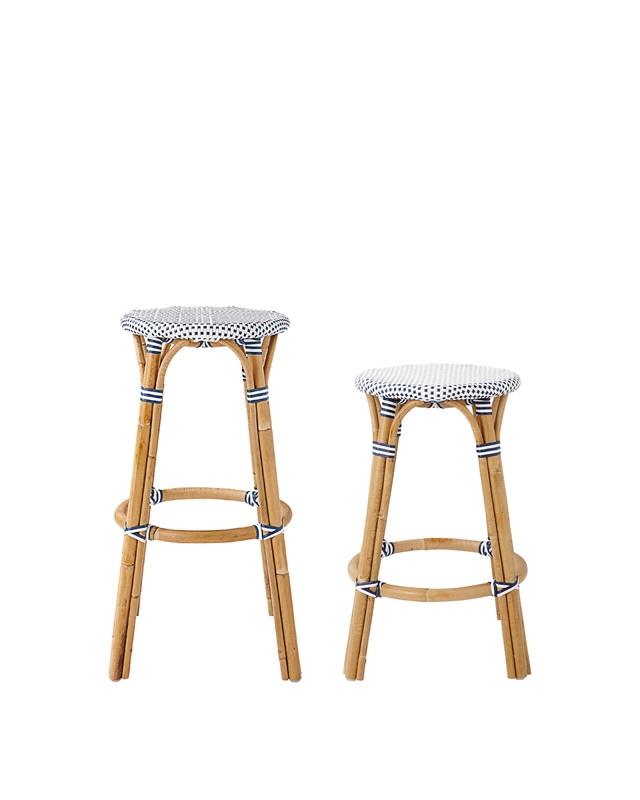 Or repurpose an old ladder for a vintage look. 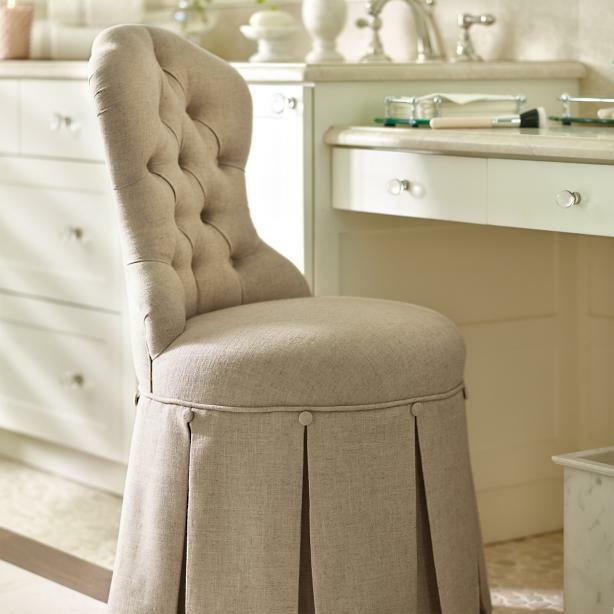 Add a touch of timeless design with a luxurious vanity stool, or bar stool that fits your personal style. Stools do not require much space and they add a lot of character. Perhaps new canisters is enough to add a fresh feel to your bathroom. 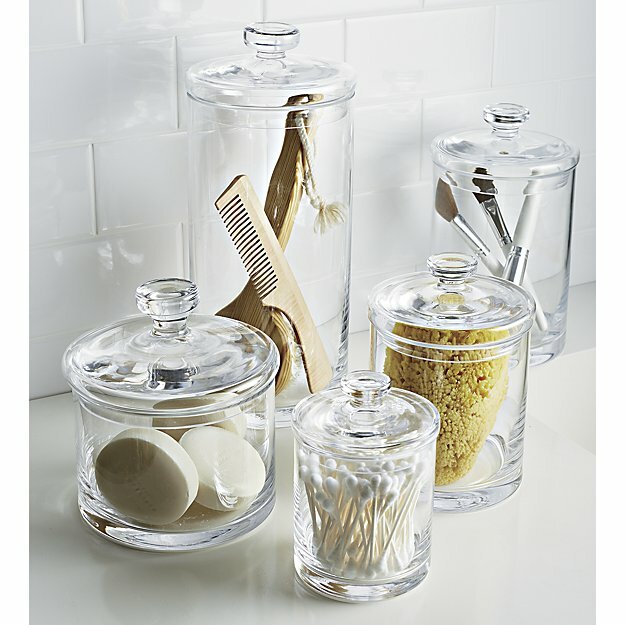 These glass canisters from Crate & Barrel range in price from $17-$40. 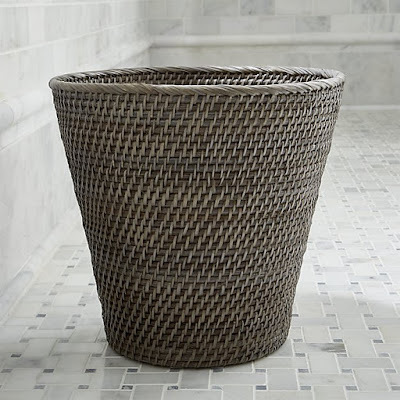 I think they add a fresh and clean look to the bathroom. 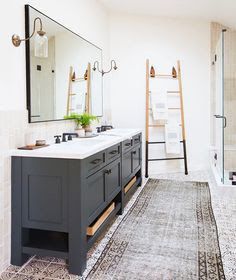 Sometimes I can't wait for my honey-do-list to be taken care of and if you're like me, well you could start knocking down walls, or just spruce up with a few simple accessories in the bathroom and leave the big ticket items for a few of the other major projects around your home.